MVP MANTLE!!! Most hobbyists would agree that the hottest cards in the hobby are high-grade 1950's/60's Hall of Famers with the iconic Mickey Mantle paving the way! It is no coincidence that the 1950's "high-grade" card market has recently soared to new heights, with each passing sale setting a seemingly endless number of record prices. One of Mantle's most popular cards continues to be his 1956 Topps #135 subject since it was this magical season that Mantle would capture both the Triple Crown and his fourth World Championship in only his sixth Major League season. 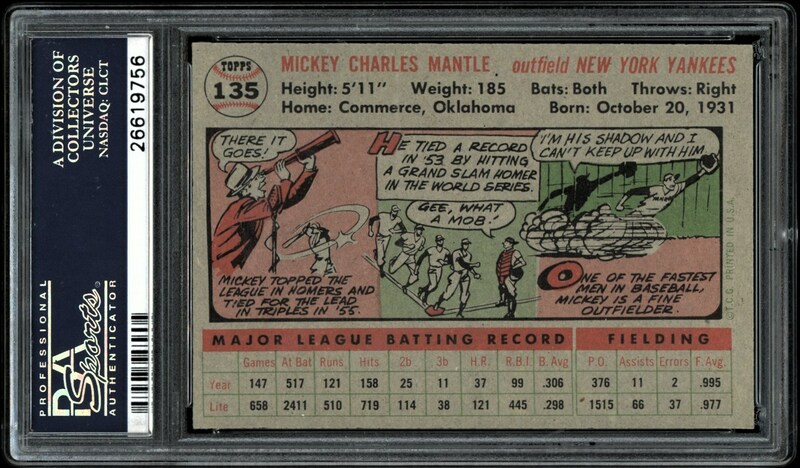 With that in mind, presented here is one of the most remarkable 1956 Topps Mantle subjects, a virtually pristine PSA NM-MT+ 8.5 marvel. It boggles the mind to think that no baseball player ever has still managed to hit a baseball as far as the "Commerce Comet" even in lieu of the vast number of steroid induced players, extreme conditioning technology, faster pitchers, and tighter stitched baseballs. Mantle's 565 ft. blast off of the Senators Chuck Stobbs still remains the furthest recorded ball ever hit in any baseball game, and it is no coincidence that "The Mick" also walloped two home runs off the façade of Yankee Stadium! 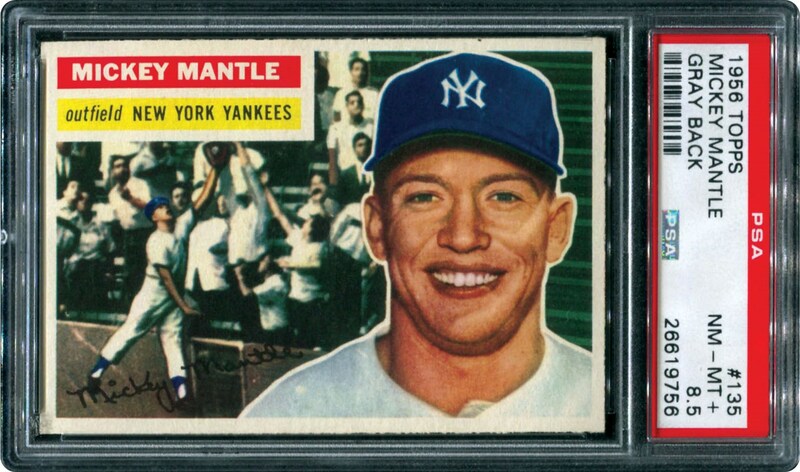 It is this supernatural "once-in-a-lifetime" power that most likely earned Mantle his unparalleled mystique among most hobbyists, and this 1956 Topps "scarce for the grade" masterpiece is the perfect testament to Mantle's legendary stature. Let's start with the super defined contrast of the classic Mantle portrait image accompanied by his great outfield acrobatic catch as he reaches in the grandstand to "rob" a hitter of a sure home run. Centering is virtually "dead on", and the borders reflect dazzling white surfaces. Four sharp corner tips highlight the razor sharp perimeter, and the surfaces are immaculate. The final exclamation point is a flawless-like verso that reveals vivid print registration and no surface blemishes. High grade Mickey Mantle cards continue to soar in value, and none could possibly surpass the sheer brilliance of this miraculous offering that resides as a "cream of the crop" collectible!